The Eco Village covers 70 acres of farmland, forest and hills in a remote mountain valley. We have begun implementing certain aspects of the overall project starting with infrastructure: water, roads, gardens and living facilities. We follow the values of Vedic culture, namely the importance of cows, land and knowledge. A Gurukula Colony with a Mandir will be the focus of all activities. We will provide primarily brahmana and ksatriya training but will also accommodate other areas of service including free education for all ages. We are located south of Saranagati Village in Western Canada. First we cleared the debris and sorted it into piles for garden mulch, wind blocking piles and burnable wood. Thin trees were thinned and used fire wood and fence materials. Larger trees can be made into building material. To accomplish this, we acquired a wood mill with a saw blade that can cut logs up to 2 feet wide. Most of the trees we are milling are only one foot wide because large trees cannot grow in a dense forest due to competition for sunlight, water and soil. Farming and cow-protection provides the foundation for self-sustaining living and also generated prosperity for the rest of the society. A village should be an ecologically closed unit. Dung from cows fertilizers the grains and vegetables, and waste from vegetables and grains is food for cows and sheep. The surplus from this ecological cycle should be sold to markets outside the village. This makes for a stable economy. 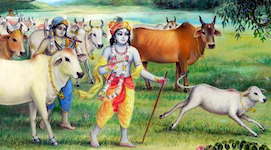 Society in Vedic history was a flourishing self-sustaining cow-centric and cow-revered culture. Cows and bulls are an essential contributors to peace and economic prosperity. Sastra tells human society how to live a simple life free from anxiety depending on the cow and bull, the land and the ample supply of natural gifts from the Creator. To cultivate this culture in our village, Govardhan Goshala hosted Gopuja in a grazing areas on the full moon purnima. The puja featured Surabhi cow and friends who were fed our locally grown foods. Our desert like summer weather normally begins in June. Everyday we are eating salad and green leafy vegetables from the garden and still carrots from last harvest. A favorite is carrot, beet and parsley juice. New vegetables are harvested every week. To plow our weedy garden plots, we employed the two ox from the Govardhan Goshala in Saranagati Village. The ox walked 2 km and stayed in a fenced off area of the garden, grazing on the grass growing on the edge of garden and between the fruit trees. A greenhouse was their temporary shelter while they lived here. One day they escaped and went home, but the next morning they were walked back to the eco village for their morning plowing duties. The ox are almost 2 years old and are away from home and mothers for the first time. The training has been good for ox health and well being. Dharma mani ox has become very friendly. The results from ox plowing are fantastic. They can nicely turn-over previously cultivated land. We will plant our seeds soon after in the plowed rows. The book analyzes the negative and highly destructive effects of industrialization and modernism tracing their source to the Industrial Revolution of the eighteenth century focusing primarily on three areas of gross neglect related to animals (especially the cows), agriculture and modern education. The author, a 45 years practitioner of the Vaisnava tradition, presents the Vedic dharmic perspective of sociology by introducing the scientific practices of a cow-based economy where land and cows form a natural symbiosis to serve the needs of humanity in the most ideal sustainable manner free from all forms of exploitation.